Joy Creek Photo Archive (c) all rights reserved We have tried many buckwheats at our nursery and have had the best success in a rockery or gravel bed. That is where we grow Eriogonum crocatum which is said to grow in crags and rock formations in clay soil. It is endemic to Ventura County, CA, and we did not expect it to survive our wet and cold winters but it has surprised us. 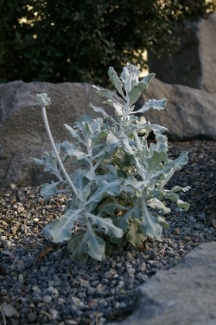 Although it has not reached the size it might in a warmer, sunnier climate, its woolly, silvery white foliage looks dramatic year-round, but especially in contrast to our gray winter skies. Like those of many of the buckwheats, its yellow flowers are attractive to bees and buterflies. They appear in flattened clusters about two or so inches wide and dry to an attractive shade of red brown. Late spring to early summer. 1.5 ft. x 2-3 ft.